Daniel Wilson at Sacramento City College. Photo by Kate Paloy. I’ve done it. You’ve done it. We’ve all done it. You see that person across the room that clearly has a physical or mental disability or condition and you can’t help but stare. If you’re like me, you tend to wonder about the best approach to feeding your curiosity. The wonderful diversity at City College and in the world as a whole leads to seeing people of many different shapes, colors, forms, and backgrounds, but there are also those of us with conditions outside our control that can be embarrassing and frustrating to handle. One such disorder is a skin condition called psoriasis. 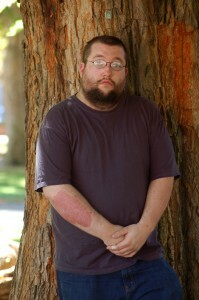 I was diagnosed with psoriasis in middle school and have dealt with it ever since. Basically, psoriasis occurs as a result of the immune system overacting and causing skin cells to multiply at over double the normal rate. This causes skin to build up, flake off, and leave behind red, dry sores. Treatments include creams and ointments, ultra-violet ray exposure, and steroidal medications. These all carry their own risks, and many of them can have worse side effects than just living with psoriasis. Web MD also explains that many factors contribute to psoriasis breakouts. Experts believe that it is a genetic disorder, but that hasn’t been confirmed. Stress, weather changes, use of alcohol or cigarettes, and in some people diet can also be factors in causing the condition to worsen. My psoriasis started out on my head when I was in seventh grade, but it flared up in 2006 and now covers over half of my body, including my arms, hands, head, legs, chest, and back. I use medicine to treat it and have learned a lot over the years about how to keep it from flaring up, but it’s a daily struggle that never gets any easier. On a daily basis I have to deal with intense itching to the point where sometimes I break down and cry. I also deal with dryness, bleeding and for about a year, I had to wear half a box of bandages on my hands every day just to be able to function. I have extreme difficulty bending up and down due to dryness on my knees, and I have to deal with so much dandruff that it appears to be snowing on my t-shirts. These are just a few of the frustrations I have to endure. However, none of this is as hard to deal with as the frustrating, but understandable ignorance of the general public. I have worked in retail for seven years and have come across many people who want to know about the sores on my head and arms. There are some who ask nicely, I tell them it is psoriasis, and we leave it at that. Those people aren’t the problem. It’s the ones who ask me anything from, “Did you get burned?” to “Was your skin ripped off by a bear?” Okay, so maybe that last one was a bit of an exaggeration, but you get the point. Web MD also states, “Psoriasis is not contagious. It cannot be spread by touch from person to person.” This is another problem I’ve encountered at my job. One customer refuses to let me help her. She swears that my condition is contagious, even though I have told her that if I were contagious, I wouldn’t be working with the public. It isn’t just the sores and the ignorance of the public that make living with psoriasis difficult. Psoriasis makes even non-affected skin brittle, rough and easily susceptible to wounds, so certain tasks in my daily life and at work are almost impossible to complete without injuring myself. It’s difficult to explain to co-workers that I just cannot do certain things, and it can be just as difficult to get a doctor to issue a note explaining what, to them, is not an issue. The medication I use is similar to Vaseline, so it’s a very thick, greasy ointment. It works wonders to keep the dry skin from building up and cracking, and over time it helps to even get rid of redness. However, it can take hours to soak into the sores, and often I have to go to bed with it on my body. Not only is this a problem because it makes it difficult to sleep, but it also means I must bathe early enough to allow it time to at least partially sink into my skin before climbing into bed. When I’m not working, this isn’t so much of an issue, but often I work back-to-back shifts, which pretty much requires me to go to bed as soon as I get home. On those nights, I have to deprive myself of sleep to allow myself enough time to use my medicine. Sometimes people will ask me what I have, and after I answer, proceed to tell me that four or five people in their family have it. They always follow that sentence by telling me some home-remedy solution. This makes me wonder why they had to ask me what I have if they are so familiar with the condition. It’s not a matter of sympathy that I seek, and I’m sure that those with disabilities, skin conditions or any other physical differences would agree. I’m not even hoping for people to keep their thoughts to themselves. I just want the general public to understand that if they’re curious about someone’s physical difference, ask him or her in a polite way and don’t try to offer him or her advice, unless they ask for it. I can tell you from first-hand experience that it’s more embarrassing and frustrating to answer uninformed questions, especially from those that ask them rudely, than to just live with the condition I unfortunately have to live with for the rest of my life. All I really want for myself and other people with physical differences is to be treated as if we’re just like everyone else. Equality is all we’re really after. This article was awarded second place in the opinion category by the Journalism Association of Community Colleges 2011 state competition. This entry was posted in Opinion, Sac City Express (SCC) and tagged award, community, condition, daniel, dermatologist, disabilities, doctor, dry, opinion, place, psoriasis, rash, sacramento, skin, wilson. Bookmark the permalink.